Nice running, jtced. Good time for that race. I'd be worried about running across those anti-tank cubes, personally - I am pretty clumsy and would fear for my ankles! JT, I dislike carrying water too. My bottle belt has a nasty habit of rotating around my waist unless I cinch it really tight, so I only use it when I have to (marathon long runs, for instance). Did my 10 yesterday without water but I was pretty thirsty by the end. 4 miles today. A really weird run. Poor night's sleep due to various factors so felt rubbish when I woke up and decided to wait a few hours. Ended up going out at 10. The intention was to do 4 easy, but it felt like the last four miles of a marathon. When I checked my splits I saw the last two miles had been a lot faster than I thought (10:19 and 10:14 - 10:15 is average MP for me) which is odd because it felt as though I was going a lot slower. Eh, well. Good hill racing, Hazel. Inclines seem to be in fashion here! Will, you make a good point about using running resources sparingly. Apart from a knee injury 27 years ago - which is currently bugging me - I've had the best part of 30 years in the sport. Heavy rain was turning the coastal park rather squelchy his morning but it didn't deter a giddy Spaniel from trying to catch ducks in the boating lake! 4 soggy miles, mostly trail & prom. It's school report writing season, with a tight deadline to meet this week - boring! Shall have to try and a fit a run or two in, once I stop procrastinating! 30 years, Swittle,and still going! Impressive. Luckily my back injury has been my only serious one and I've been no problems since I started running, except the odd sore knee and black toe nail. I do take care of myself though, as am aware that prevention is much better than cure. Thank you, Will. I've been very fortunate and Streaks of 1315 and 1645 days in the past 10 years are testament to that. I may be moving into overuse territory in my present 540+ day sequence. Good running going on by all. Will, there's not much chance of me getting to the front of those races, there are some very good participants. The first man got in in less 1 hour the first lady just over 1 hour. I needed half an hour more.. I'm another one who dislikes bottle belts - I have tried several but all slip, slide and joggle around. I now carry a hydration rucksack on longer summer runs which works much better for me. Standard Tuesday trot yesterday evening with my group - only four of us out. 10.4 in 00:58:35. Quiet sort of evening despite the nice weather. Was able to push up the hilly bits (we have around +270m on our route) quite well - a group of young(ish) men sitting outside a farm building commenting on our efforts helped - we even managed a minor sprint to give them something to watch - they did cheer at least..
Glute pain can be a lot of things, jtced, ranging from general tightness and knottiness to piriformis issues to high hamstring tendinopathy (which is what I have). Oh, and sciatica, too. I've run with an achey bum for a good while - just listen to it and as long as it doesn't get worse, you're probably OK. Dare I ask about the heels? I've entered an evening race (10K) next week as a practise for my forthcoming 10 miler so I decided to do an evening run today. I'm very much a morning person but I actually did a fairly decent run - 4 miles with 2 x 1 mile intervals. The warm-up mile and recovery miles (miles 1 and 3) were actually faster than my usual easy pace, so maybe evening running isn't such a bad thing for me. I did another evening run (as last night's hyped me up a bit so I was too wired to go to bed at my normal bedtime, meaning I was too tired this morning). Did 4 miles again. It was meant to be easy pace but was more like MP (last two miles actually a tad quicker). I'm obviously more warmed up in the evening, even if I prefer to run earlier. Park run, first sub 23. Sorry to go offtopic, but I joined up here to ask a question, but cannot see a new topic button. Can anybody help? Finally stopped raining today so out this evening for 9.5miles in 1hr10. It being cooler makes a difference. Natural quicker pace first few miles, but then incrementally slowed up. Hmm. Need long steady miles. Lots of other runners about. My partner is away for a fortnight which gives a little more flexibility as and when I run. I'm under instruction not to go feral. I can't promise anything. Lovin' the cuban heel boots jtced. Park_run_fan - it's because you're new. Once you've contributed to a few posts you'll be able to start your own threads. But for now, welcome. Nice running, Nessie and JT. Glad it's cooler again (although it was 18 degrees for me run this evening - not that cool really). Make the most of it JT. 33km in 3:21 yesterday. Pretty windy here so I didn't take the flat route I was planning on but rather a hilly route with more protection thanks to the woods and valleys. Watch says around 700m+ in total but I think its exaggerating a bit. The up bit went well but I didn't get the hydration and fueling right this time. I had to take a walk break for a few hundred metres on the return leg at around 19km as I started to feel very light headed / slightly sick. Got going again but became thirsty after a while and had to ration out the water (had my hydration rucksack with me). I don't like the feeling of water sloshing around in my stomach and don't therefore like gulping down a lot in one go. I'm not good at drinking from the outset - I need to work out how to set my watch up to beep every now and then to tell me to drink something even if I don't want to. Pretty tired by the end - i had set out with a minimum goal of 30km and ideal would have been 35. Couldn't face adding on an extra loop at the end just to do those last 2km. Didn't wear my brand new trail shoes even though I was very tempted. Will try those out later on a gentle jog to collect my bike from the station where it has been abandoned yet again. Blimey Hazel !! That is some running! Am ever impressed with your hilly miles! I'm running in a mountain marathon in a month's time Nessie Have a good race tomorrow. 5km recovery jog in the new shoes today, got some La Sportiva Bushidos. Legs a bit grumbly from yesterday's efforts but once I warmed up a bit I could potter along steadily with no particular discomfort. Shoes felt okay on that short distance, nice and direct, none of that squidgey stuff (errm cushioning?) Also they are red Yes I know I shouldn't buy them by the colour I would also have taken any other than pink.. I also signed up for the marathon in Frankfurt at the end of October earlier. Had been dithering whether to or not but the price goes up as of tomorrow. Haven't told OH yet, don't know how amused he will be... Will have to think out a plan to move from long, slow uphills to long, flat and fast (eventually). Good running Hazel. Hello Ness. 12miles this evening in 1hr32. A more easy even pace but still unwittingly slowing toward the end. A misty rain swept through. Followed the hidden cycle track that follows a former railroad, then swung by the university and home following the river. July has to be a strong month of training for me. June was a bit of a wash out for various reasons, but have just finished writing my last school report (hooray - they take blimmin' ages!) so I'm free to run and run. With 2 halfs in September/October I need to get really in shape now, as I'll be away in Croatia most of August and training will be in holiday mode. So, I ran my first ever Park Run this morning, in Norwich. My brother in law is coming up next week and he's a 100+ and 21 minute PRer, so I thought I'd better have a go. A bit crowded for my liking and a bit of a short, fast distance for me, but found it very enjoyable and a great and different type of pace training. Happy with my time of 25:23 and had a nice gentle 1.5 mile warm-up and warm down getting to and from the park. PR really is a smashingly good organisation. Will be at the Junior PR with my boy tomorrow. Happy weekend all! Well done on getting those reports done, Will - I was a primary PE teacher for 5 years and report writing (along with lesson plans that I almost never adhered to) was one of my least favourite parts of the job. That and the constant colds. I'm like you in that I find 5K a bit full on. I had a pretty lacklustre parkrun today myself - official time was 27:47. I didn't push myself greatly as a have a 10K on Wednesday, but I still found it quite tough. Looking at last year's times, there was a big gap over the summer between May and September where I didn't get any PBs, so clearly I prefer cooler weather. 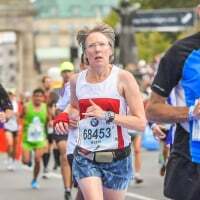 My current PB was set in November. Hazelnut - which marathon are you doing? How did you get on at Forest Five, Nessie? We offer only original high-quality IDs and passport, visa, driving license, identity cards, marriage certificates, diplomas, etc. Buy, get genuine and original passport, ID. Nice parkruns Will and Cal and good race Nessie. Cal it's the SwissAlpine K47 in Davos. Just short of 8km this evening including 5 at tempo pace. Was surprisingly fresh and could have gone longer. Saw one plump hare doing an impressive sprint in the opposite direction and several swifts, swallows or martins - not sure which - darting around after the insects. Still quite windy and cool. 9.1miles in 1hr10. Windy and the sun came out and it heated up. Started to get pretty tired. Should have taken water. Not fast but at least consistent(ish). Saw a Red Arrow flying about. Just one. Something forlorn about a Red Arrow on its own. That's a quick 9 miles, JT! Great running Nessie and Cal, too. I can't seem to escape teaching. Despite the workload, pay freeze and nonsense that is Ofsted, the kids are still great and the hols always make up for the tough times. I did a very pedestrian 6 miles this morning. Quite stiff after my debut Park Run, so it was more of a stretch out. Also, the Mexican I ha last night made for some interesting stomach gymnastics! Bird of the run was a handsome Great Crested Grebe. Wading through the spam, I'm able to see the quality & consistency of training reported on MLR. I'm following heated debate on fetcheveryone.com about the redesignation of the last person in a parkrun as 'tailwalker'. The concept of parkrun is fine but I can't justify a 22-mile round trip to my nearest one, especially when I have miles of beach, park and trail on my doorstep. Well done Nessie! I'll have to join you for one of those but it's a bit of a schlep from where I am. What's the nearest station? JT - maybe it was out for some sort of mechanical test? swittle - yeah, they should just call it tail marshall or something. My own parkrun is busy so the tail person always walks, since there are always walkers at the back. But I'd imagine a few of the smaller parkruns might not have any walkers. Will - yeah I was in a private school so no Oftsted, but we had our own inspections body. Boy I hated those inspections. Pedestrian 6 for me too. Body felt tired but the weather was pleasant. I averaged around 10:40, which is standard easy pace (though my miles varied between 11:08 for the first one to 10:26 for the fastest). I write this in a state of fatigue! Did 12 miles with my younger son (he on bike, me on foot) - steady run, as planned, 1:50. And then, to really push myself, did 18.5 miles along the coastal path (including hilly bits and sandy sections) in exactly 3:00 yesterday morning. Struggled a bit at the end of the Sunday long run, but then running a couple of miles along the sand does sap energy. Walked the last mile in fact. PS. The 12-miler was on Saturday early evening, not on the same day as the long run.... forgot to say that. Just under 4mile barefoot run in my evoski foot condom things. Nice not to go so far as have been pretty tired recently, but tough on the feet. Got stopped for directions. His English wasn't great so it got kind of involved and I felt morally responsible that he got there okay. At the end he seemed to ask for my mobile phone, or mobile number. In hindsight was I being hit upon or politely mugged? Probably neither. Also, down the end of a country road a parked car of young lads looking almost comically suspicious. It's a wonder I got home safely.